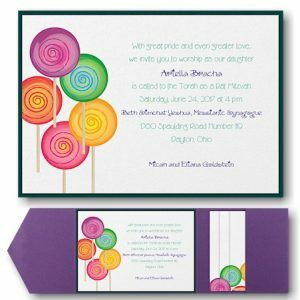 View cart “Zing Bat Mitzvah Invitation” has been added to your cart. This contemporary Bat Mitzvah invitation is printed on White Linen card stock layered over Rainbow card stock. 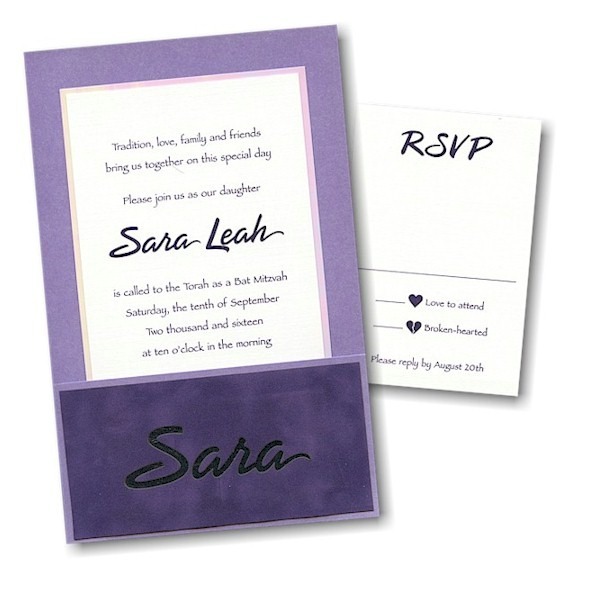 The layered invitation is placed in a Lavender Frost Pocket with Purple Suede top layer. 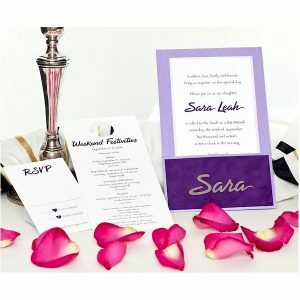 The Purple Suede is laser die cut to reveal the Bat Mitzvah’s name in Silver Mira stock. This contemporary Bat Mitzvah invitation is printed on White Linen card stock layered over Rainbow card stock. The layered invitation is placed in a Lavender Frost Pocket with Purple Suede top layer. The Purple Suede is laser die cut to reveal the Bat Mitzvah’s name in Silver Mira stock. Measures 5-3/4″ wide by 9″ high. Shown with Purple ink and Lettering styles Papyrus (body) and Calligraphy #13 (name and headings). The Reception and Response enclosures print on single Bright White Linen card stock, and the Informal notes print on matching folder stock. This Bat Mitzvah invitation is accompanied by single Bright White Linen envelopes.